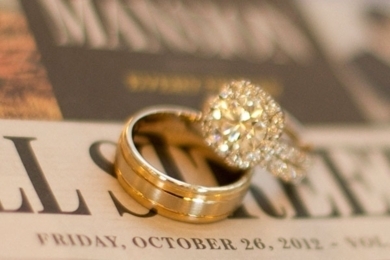 Everything You Need to Know About Engraving Your Wedding Bands! Planning a wedding comes with plenty of BIG decisions — where you want to have the event, what you’re going to wear, who to include in your wedding party to name a few. But there’s one major decision that’s so little in size (not significance!) 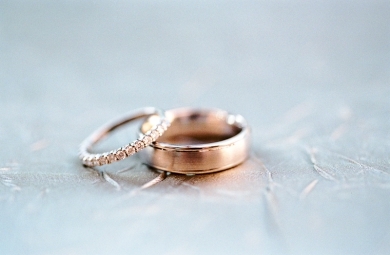 that it’s easy to overlook: the engraving on your wedding bands! 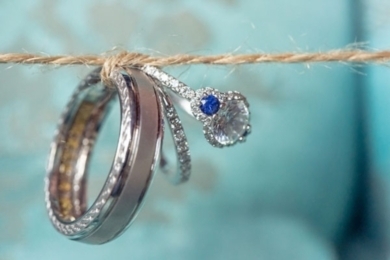 It’s the ultimate way to personalize your rings, but not everyone thinks to do this before their nuptials. 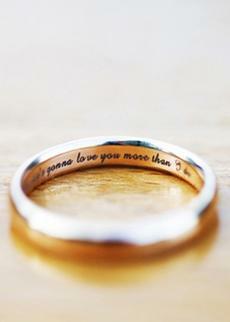 So here are a few details to consider before you decide how and WHAT to inscribe on your big day bands. 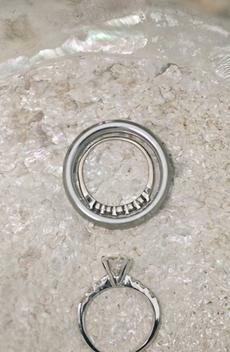 How to do it: When you go into the jeweler to try on and order the ring, make sure you put in a request to get your band engraved. You’ll be able to get a sense of whether the jeweler can actually do it for you — if not, ask for a referral for an engraver he or she trusts. 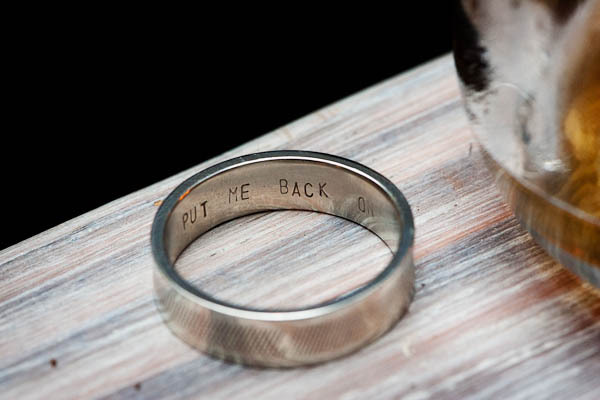 Regardless of who takes on the task of engraving your rings, you want to make sure you quadruple check the spelling of your requested inscription…you don’t want to wear a ring for the rest of your life with your fiancé’s name spelled all wonky! When to do it: Engraving can be a quick process, but not always. Some engravers will be able to do it while you wait while others may require up to one month. The amount of time it will take usually depends on your jeweler’s other projects and general workload. 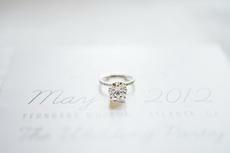 Just be sure to talk to your jeweler ASAP to figure out how long your will take so you can plan ahead. Consider the cost: Want to inscribe a quote or favorite song lyric? That’ll cost you more than just doing your names or initials; the final cost is usually based on the number of characters in the message and the specific font you choose. 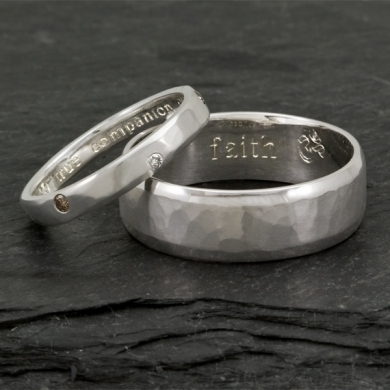 Another factor to consider is whether you’re going to have it engraved by hand or machine. As with most things, the machine engraving tends to be cheaper, but less personal than the hand-engraving option. 1. Your wedding date. 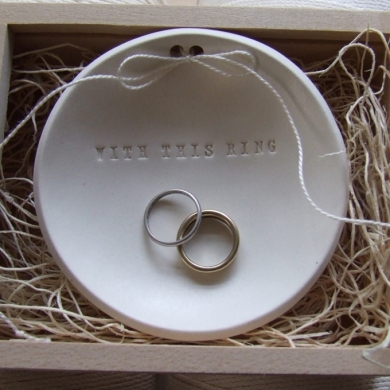 Simple and sweet, this inscription makes sure you never forget your anniversary. It’s a win-win, really. 2. The coordinates of a special spot. 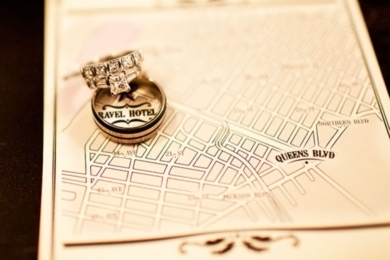 Put the latitude and longitude of where you met, got engaged or will exchange your vows. It’s a meaningful message, but since not too many people are well-versed on coordinates, it will also be like a secret code between you and your partner! 3. You new last name. 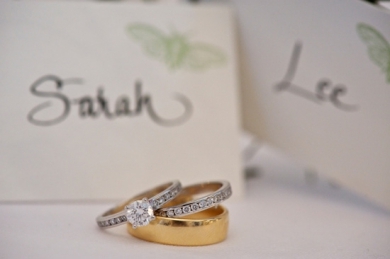 If you choose to change your last name, a wedding band is the perfect place to wear your new moniker. Your new monogram is another great option! 4. Your names, pet names or initials. Don’t over think it! There’s something so nice about a simple “AM + KT.” Or, if you have a special nickname for each other, make it permanent with an inscription. 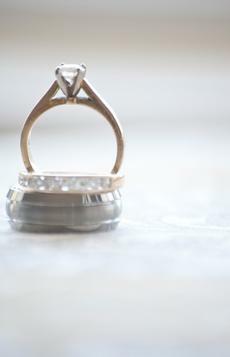 It’s bound to make your partner smile and think of you every time they put on their ring. 5. A special quote or phrase. Do you two have an inside joke that perfectly captures your love? Maybe a phrase from your vows that sums up your relationship? 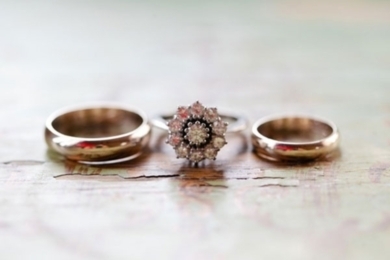 If it’s short and sweet, it might be the perfect fit for your ring! 6. Lyrics from your first dance song. Pick your favorite line from your first dance song (or another tune that’s special to the two of you), and have it engraved on the inside of your wedding bands. 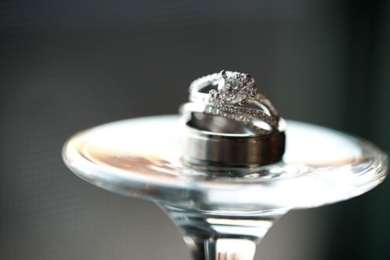 If the line is a little long, you could put the first half on your ring and the second half on your future spouse’s. 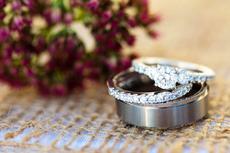 Browse more wonderful wedding rings on Lover.ly!